It's that time of year again where we all sit down talk about club issues and get drunk (well not the last thing). This years AGM will be held in the bar at Mannofield Cricket ground on Friday 6th March at 6pm sharp. We shall be addressing various issues for the upcoming season so please turn up and voice your ideas. If you have any problems at all please contact me (if you need picked up or anything else), for all the new players that have recently joined us its a good opportunity to meet some of the guys before the start of the season. * When will we practise (discuss for two weeks and then decide "Wednesday" again). * Who has the kit? * Why do we have so many left handed batting gloves? Submitted by stephen on 27 February 2009 - 12:12pm. 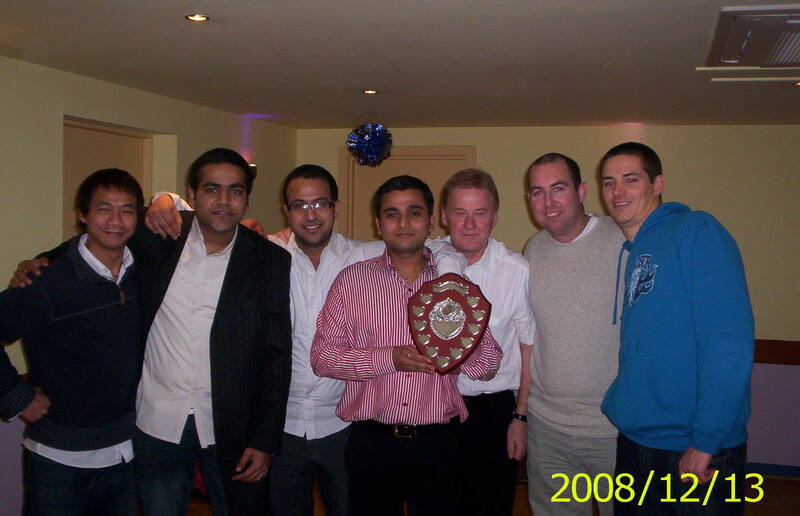 Chetan Aggarwal was presented with the David Bowie MVP Shield at Portcullis's Christmas night earlier this week. Chetan's 255 runs, 23 wickets and 6 catches in 12 games was the best all round performance of the year, narrowly beating Rahul Narula into second place. Congratulations to both for a very solid performance - one that we hope they'll repeat next year as we fight to return to Grade 3. Portcullis also said farewell to Bret Dodds, who will be returning to his native Australia after many years of loyal service. Doddsy's explosive batting, threatening bowling and solid fielding skills have made him an important part of the tea, and he will be sorely missed next season, both on and off the pitch. Submitted by stephen on 22 December 2008 - 10:24pm. Vice Captain David Cox's first time as skipper of Portcullis ended in success last Saturday with a 30 run win over 2nd Dunecht. Submitted by stephen on 21 May 2008 - 12:47pm. Last week we had a no opponents and no pitch. This week we have opponents but no pitch. Huntly's new wicket will not be ready in time, so we have agreed yet again to postpone the game in the interests of making sure we keep our whites clean for another week. Next week's postponement will be against Stonehaven. Submitted by stephen on 30 April 2008 - 3:54pm. 2nd Mannofield are not able to raise a side for the opening game of the 2008 season so, in the interests of playing cricket, we have accepted a postponement instead. A date for the rearranged fixture has not yet been set. Submitted by stephen on 25 April 2008 - 2:18pm. Regular outdoor practice sessions will be starting again after the clocks change. They will be on Wednesday evenings on the plastic wicket in Duthie Park, starting at 6pm. Vice skipper Dave Cox is going to be running the sessions and is planning to make them rather more structured than they have been in the past. We don't have much light at this time of year, so please be prompt so we can get a good session in before it gets too dark. Submitted by stephen on 26 March 2008 - 12:14pm. The Mighty 'Cullis has a new skipper. Paul Brown bravely stepped into the breach at last night's pre-season meeting, with Dave Cox volunteering to be Vice Captain. 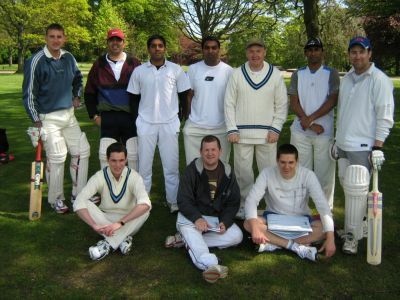 Paul is an experienced cricketer and one of the longest serving members of the club. Mike Horrocks and Bob Adie are continuing as Secretary and Treasurer, although they indicated that volunteers to fill both these posts will be needed next year. I'm going to continue to run the web site. Submitted by stephen on 15 March 2008 - 1:32pm. All Portcullis members are invited to a meeting to discuss plans for the coming season. The meeting will be at 6.00pm on Friday 14th March at Mannofield (in the upstair area on the far side of the bar). Submitted by stephen on 8 March 2008 - 9:27pm. The Portcullis Picture Gallery has returned after a brief absence during the web site update. You can find it by clicking on the big "Gallery" button in the menu bar above. Please feel free to upload any Portcullis related pictures you might like to share with the club and the rest of the world. Submitted by stephen on 5 March 2008 - 11:53am. Grant Huitson became the first recipient of the David Bowie Shield when he won the 2007 Most Valuable Player competition. 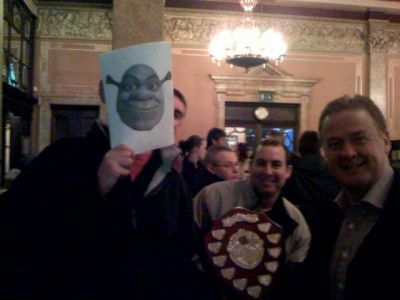 Unfortunately, he wasn't available to collect his trophy, so instead we got a look-a-like along instead. Submitted by stephen on 4 March 2008 - 11:15pm.